We got an annual membership to the Monterey Bay Aquarium from Ian's parents for Christmas last year. Wanting to squeeze in one last trip before it expired, we decided Veteran's Day would be the perfect time to go. We don't normally spend the night, but decided to stay over there as well. Isla was particularly excited to go, as she was obsessed with the book Fancy Nancy Peanut Butter and Jellyfish that we check out from the library. 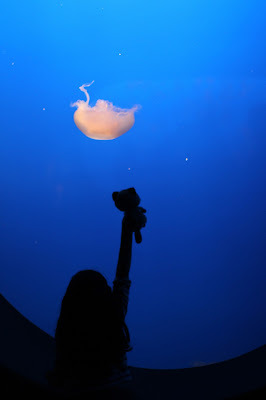 She was particularly excited about bringing one of her stuffed animals, Rocco, to see the jellyfish. She literally talked to everyone about the trip when I told her we were going. It was fun to see her be so excited. This trip was also particularly fun because Connor would read all the plaques and be in awe about the facts he just read. It just seemed like those two were in more awe this time at the aquarium than in past visits and that made it particularly fun. Callum got in on the action too, getting to grab at fish and jellyfish through the glass. And him and I got to watch some large fish being fed, which was super fun...the two of us literally got our own little show as we stumbled upon them getting ready to feed some fish while I was trying to walk him to sleep. The worker explained everything to us and fed them right in front of us. Again, very cool. Callum also got to play in the water play in the toddler section. He really dug that and came out soaking wet. Our night didn't go so well, with Callum spiking a fever and Ian having to go to the store in the middle of the night for a thermometer and medicine. And four days on, the little guy is still pretty sick and miserable. But, we still had loads of fun at the aquarium before he got sick. It's funny how our last trip there, the drive didn't go so well. This time, we got home and Connor said, "We are home already?! That was fast." You just never know with kids and car trips!